LMNOP: 2019 Workshop Series presents Selling Skills in the Architectural and Design Community by John Dano of Benhar Office Interiors. Join LMNOP + Poppin to mix, mingle, and celebrate the arrival of Spring and our 10 years in the A&D community! LMNOP offers multiple workshops each year on a variety of topics all geared toward professional development for individuals in the A&D community. IDCEC and AIA CEU credit is available for attendees at select workshops, often in partnership with organizations such as IIDA, AIA, ASID, and others. LMNOP sponsors three mixers each year, one in the spring, one mid-summer and one for the holidays in December. Our mixers bring people together from all areas of the industry to catch up, share stories, and enjoy good food and drink. Our mixers are a great way to meet new people, grow your professional network, and learn the latest industry news. 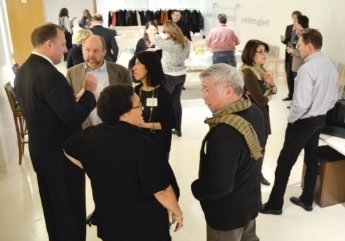 Partner with us to support our growing community of design leaders helping to ensure a stronger industry of tomorrow. Participate in networking events, benefits, workshops and volunteer opportunities, all organized by your colleagues. Follow us on social media to stay informed on the fastest growing community for A&D professionals in New York City. Please enter your e-mail address to be placed on the LMNOP mailing list.